Last year, the NEC came out with a new uniform combination that the National Commander himself has asked all CAP members to wear. The uniform, featured at right, consists of a double-breasted jacket, white 'aviator' style shirt, and blue tie. Rank insignia is worn on the epaulets, with pin-on rank on the coat, and blue epaulet sleeves on the undershirt. I did not want to bash this uniform without wearing it myself, and so when I came into some money, I purchased one, complete with all the insignia. When it came, I arranged it, ironed it, and put it on. From a purely cosmetic view, the uniform itself is not too bad looking. Surely it could look better, but it could also be much worse. The uniform itself (if worn without ribbons, or if ribbons are kept to a minimum) resembles the dress uniform worn by many fire companies, evoking images of them to the general public. This is a pleasing alternative to the Corporate Blazer, as being in the business of Emergency Services, CAP should at least look the part. When the Jacket is removed, leaving just the white shirt and epaulets, it can resemble an airline pilot, or, again, a fireman. On a positive note: This uniform can be used as both a Service and Mess Dress uniform, substituting a Bow-Tie for the regular Tie to create the latter. This saves many of us time and money, and creates a professional appearance during formal ceremonies. I also like the pin-on rank insignias. They look more professional than the cloth ranks worn on the other combinations. In addition, I am a proponent of wearing the "CAP" cutouts on the lapels. 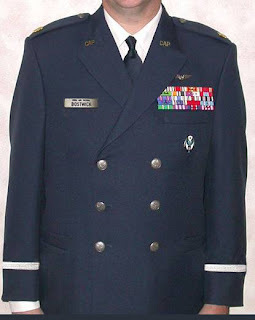 Although I understand the honor associated with wearing the "U.S." cutouts on our Air Force Style Blues, I feel uncomfortable wearing such devices for the same reasons I dislike the blue epaulets (see below). The Downside: Like many on CAPTalk have expressed, wearing Air Force Rank Epaulets makes me feel uncomfortable. Others have done so much more than I with those epaulets on their shoulders, why should I wear them? Like many, I would be happier if 'CAP' was embroidered atop the rank, so as to eliminate this uncomfortable part. In addition, a fellow CAP officer, upon first seeing it, described it as a "pimp" jacket, which I can definitely see, and may even agree with. I've decided to stick with our Short-Sleeve Blues for now, and pull this thing out if the Region Commander shows up, as she is very much a proponent of this combination. I figure it might not be a bad thing to have her on my side. In addition, I may use it as an alternative to the mess-dress as a cost-saving measure.